Dr. Heubner was born and raised in Cedar Rapids, Iowa. He graduated high school as Salutatorian of his class and was a member of the National Honor Society. 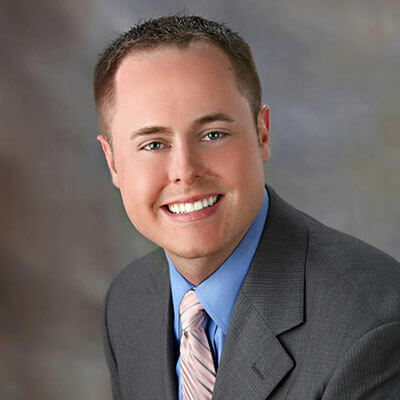 After attending The University of Iowa for his undergraduate studies, Dr. Heubner was accepted into The University of Iowa College of Dentistry where he obtained his Doctor of Dental Surgery degree in 2007. Dr. Heubner continued his education by completing a postgraduate residency at Denver Health Medical Center in Denver, Colorado. This rigorous 1-year program fully prepared Dr. Heubner to meet the oral health needs of a broad range of patients at a higher level of care. In 2008, Dr. Heubner returned to Iowa to join River Ridge Dental Care and share in Dr. Camp’s commitment to excellence. In January of 2013, Dr. Heubner purchased the practice from Dr. Camp and became sole owner. Dr. Heubner has a passion to provide the highest quality of care to his patients using the most advanced techniques and materials. He frequently attends advanced training seminars and hands-on workshops across the country in order to hone his current skills and to learn new ones. He maintains professional memberships in the American Dental Association, American Academy of Cosmetic Dentistry, Iowa Dental Association, Academy of General Dentistry (Fellow), American Academy of Dental Sleep Medicine and the Des Moines County Dental Society. Dr. Heubner has served as President of the Des Moines County Dental Society for the past three years and is Vice President of the Southeast Iowa District of the Iowa Dental Association. Dr. Heubner enjoys staying active in his community. He is a member of the Burlington Rotary Club, where he donates his time and money for various community improvement projects and events. Rotary is also an organization whose members take an oath to maintain the highest ethical standards in their businesses and professions. Dr. Heubner is also a member of the Burlington/West Burlington Area Chamber of Commerce and the Greater Burlington Young Professionals Group. Dr. Heubner met his wife, Stephanie, while both were attending college at The University of Iowa. They were married in July of 2010 and currently reside in Burlington. The couple has three children: Evan, Liza, and Ruby. Dr. Heubner enjoys spending free time with this family and friends, as well as volunteering for local events and organizations. He also enjoys cycling and watching sports, especially the Iowa Hawkeyes and Atlanta Braves.